Modern, romantic, and rustic, smoke-free tiny house cabin with sleeping loft. Please note: This cabin is undergoing massive upgrades for our guest's enjoyment. This is to include, all new kitchen appliances, & cabinetry. All new floorings, pine walls & additional egress, outside deck & new outside shower area. Updated pictures will be posted closer to the completion date of May 1st. A rustic, romantic & modern, smoke-free tiny house cabin with sleeping loft, WiFi, HDTV & small pantry and kitchen. Sleeps 2 in the loft, & 2 in the sleeper sofa. You're just about roughin' it here, but with most modern amenities, but don't forget a tiny home! Primitive means we do have running water on site, with electric and WiFi, we give you the cleanest bathroom port-a-john and shower hut for your use & lots of bottled water, water for hand washing, cooking & shower hut! Our tiny home cabin is small but packed with lots of modern amenities. Located on 17.5+ acres of private campground property & boarding state game lands, and the Appalachian Trail makes our location very unique. We are just a few miles from Fuller & Laurel Lake, & Long Pine Run Reservoir for kayaking and fishing. Camping is fantastic at this location with a fire pit close by, picnic table, and outside grill with many open acres for your activities. Our cabin is located at the campground, so some action is to be expected on the property with close neighbors. Our cabin includes a small pantry, mini fridge, coffee maker, microwave, and toaster oven & outside propane grill. HDTV & basic Wifi internet included. Our sleeping areas include 1 queen memory foam mattress in loft area & 1 sleeper sofa to accommodate 2 people. Linen is provided only for the loft area. Please note, there is no running water inside the cabin. We have a water source outside, include some bottled water for drinking, cooking, coffee, etc too. You are encouraged to bring your own water. 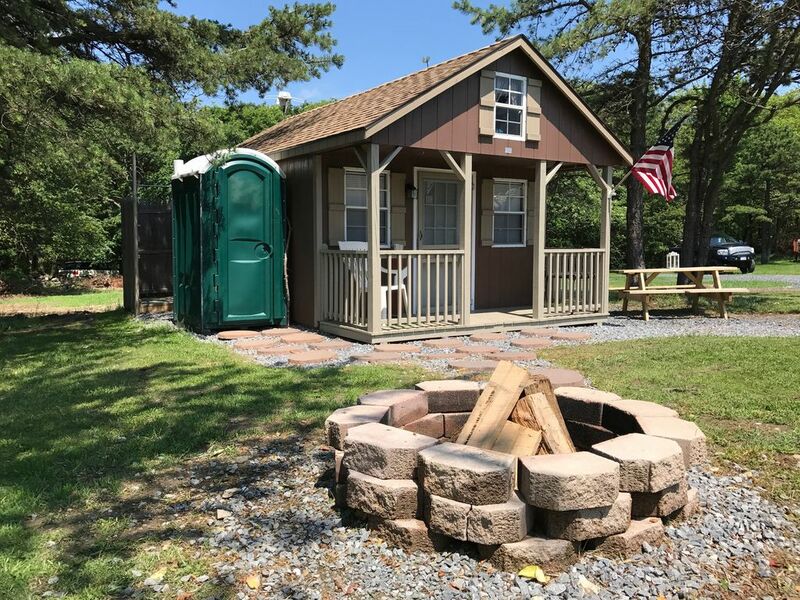 The bathroom is a port-a-potty that is cleaned before your stay, and the shower is an outside camping shower that is not always warm. This is a primitive cabin, so if these features may scare you and you can't get away from modern day amenities, I would look for a hotel instead. Cabin guests are able to access the entire campground, any weekend events at the campground & utalize the area around the cabin. I am always on Airbnb or mobile and can respond to any questions quickly, but don't expect me to say in this cabin with you. On occasion, I may be in a tent or hammock on the weekends camping too, but usually, I'm just 10 miles away from cabin location. You will be provided with a special key code for entrance to my cabin, and your stay is private and alone. Want recommendations? Me too cook your the best steak ever? Or to hang out and drink a beer or two? Just ask, I will be glad to join you to show you a good time. Cleaning Fee: We charge a 25$ cleaning fee for the cabin rental for your entire stay. 1) Remove all bedding, including bedspreads, etc and have them cleaned. 2) Clean the carpets to remove any pet dander that might be a cause for allergic reaction in others. 3) Clean all the upholstered furniture in the same manner for the same reason. Please understand, the cleaning fees are a bit high if you have a pet too. An additional $50 actually. Sometimes this fee may not be justifiable if staying for 1 night. Please do understand this fee is to better serve you and future guests. Additional options are available and must be paid with booking. Please request with booking. Outside bathroom only. Includes porta-potty and outside shower hut. We enjoyed our stay at this little cabin. The cabin is small but it is clean and very well stocked with almost everything imaginable. Thank you Jamie for providing such a cozy and inviting space for our family vacation. The cabin was wonderful and stocked with all sorts of extras like coffee and snacks. The cabin was also exceptionally clean. The staff were very friendly and offered some great suggestions for activities in the area. I would recommend this cabin to anyone. Property was a great place for camping and Recreation! Right next to Appalachian Trail. Host is great! Highly recommended!